It is hoped the technology will allow pilots to fly missions that would not otherwise have been possible. 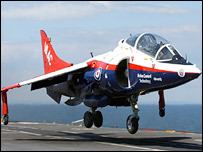 The device works by linking a STOVL aircraft, via satellite and radio, to an aircraft carrier, Mr Howitt said. "We are trying to make the task of recovering the aircraft to the carrier as simple as possible and let pilots focus on their war mission," he added. JSF: The last manned fighter?